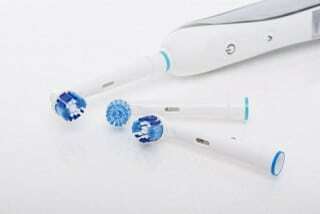 Electric toothbrushes are much more effective at removing plaque than manual brushing. Although they may require a slight adjustment period because of their power; once you get used to them, you’ll be able to notice the difference in cleanliness between electric brushing and manual brushing. We carry Sonicare because we find that the soft bristle head brush, combined with the built in timer helps create a healthy hygiene habit. Most research done on the higher end electric toothbrushes has had positive outcomes so we advise you to purchase a high quality electric toothbrush.